A wave of Percy Jackson fandom has swept over our house in the last month. The last time this happened, my oldest was finishing 5th grade, and the first Percy Jackson movie was hitting the theaters. He read every book, raved about the movie, but our other boys were quite young then and the fire dwindled as he grew a little older. Always on the lookout for new audiobooks for our two younger boys, I purchased Percy Jackson and the Lightning Thief last month, and it has been on auto-repeat in their bedroom ever since. I admit to having a slight ulterior motive for this move. 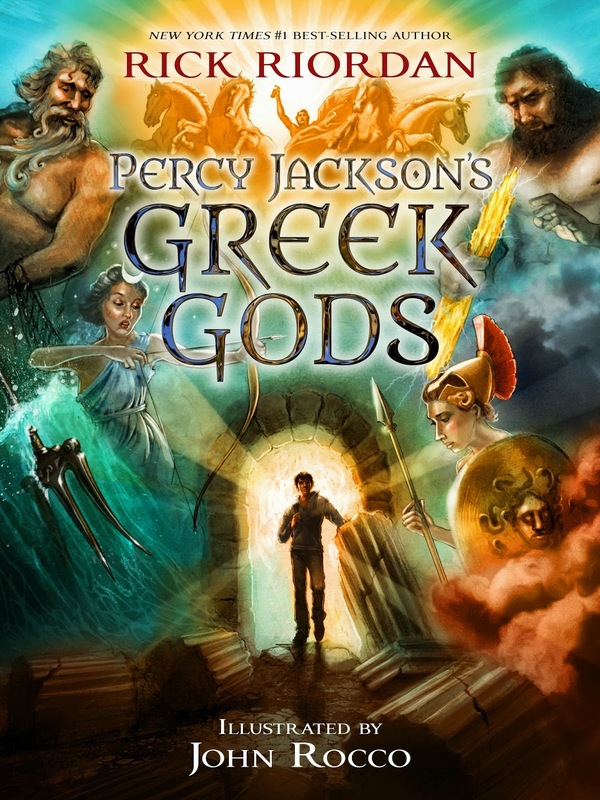 In addition to beginning a series, insuring fresh audio material for the next few months to come, I also managed to score a signed copy of Percy Jackson's Greek Gods when it hit bookstores last month. A perfect birthday present for my middle boy's upcoming birthday; the same boy who slept with d'Aulaires Book of Greek Myths for months last year! Percy Jackson's Greek Gods is an imposing, grand book with a fabulously illustrated cover. For a Percy Jackson lover, the language, from Percy's own perspective and with his signature sarcasm, is highly descriptive and a perfect touch to lends an air of authenticity to the Greek mythology. Told from Percy's point of view, these stories will entice many young readers who might not otherwise read Greek mythology and will bring a fresh retelling to children who enjoy hearing the tales again and again. A new category of memoir has appeared on stage in children's literature: graphic novel memoirs. 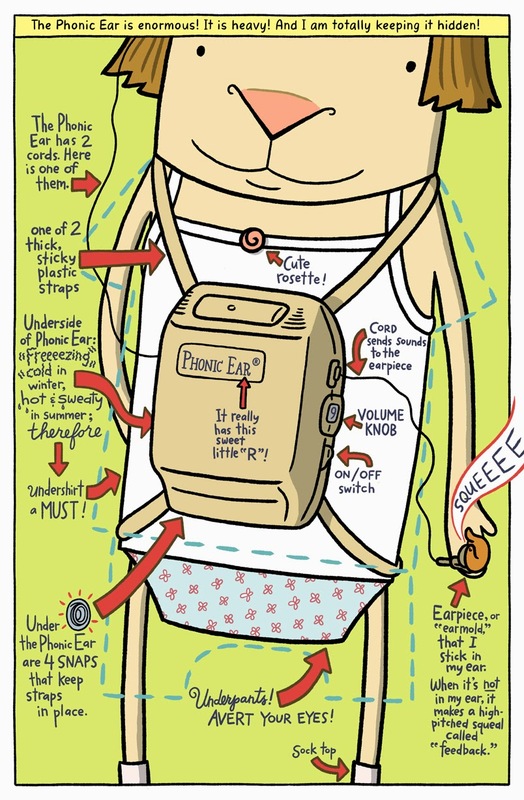 I first saw what an effective medium this could be in Raina Telgemeier's Sisters. El Deafo is another perfect example of how fascinating and funny a memoir can be when it's delivered in graphic novel form. 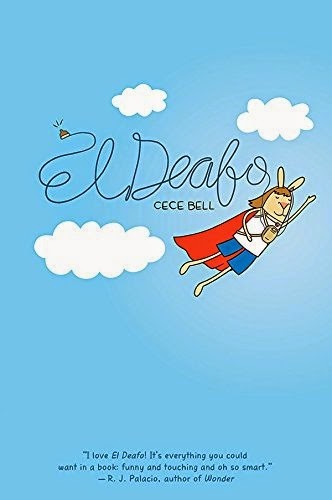 El Deafo narrates author Cece Bell's childhood from age 4, when she loses her hearing as a result of meningitis, to about 5th grade. 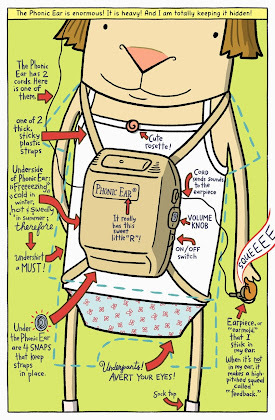 Bell uses anthropomorphic bunnies to represent herself, her family and friends. This is really a fabulous idea as bunny ears are very noticeable, and Bell clearly feels similarly about her hearing aids. As Bell begins school and realizes that lip-reading is not quite adequate, she receives a phonic ear which allows her to hear the teacher through a special microphone around the teacher's neck. Bell spends the next few years with a secret: she can hear every conversation, every action of her teacher while the microphone is turned on, including her teacher's private discussions with other teachers in the hall and her teacher's um...bathroom activity. 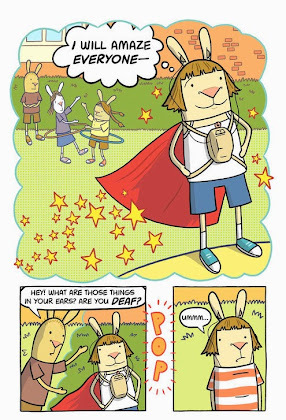 Bell clearly finds this amusing, and because of her newly discovered superpower, she nicknames herself El Deafo. Intertwined in her story is her struggle to feel normal and to find true friends. Many children who feel different in a variety of ways will identify strongly with Bell's feelings here. Parts of Bell's story are difficult and sad, but her strength and perseverance shines. 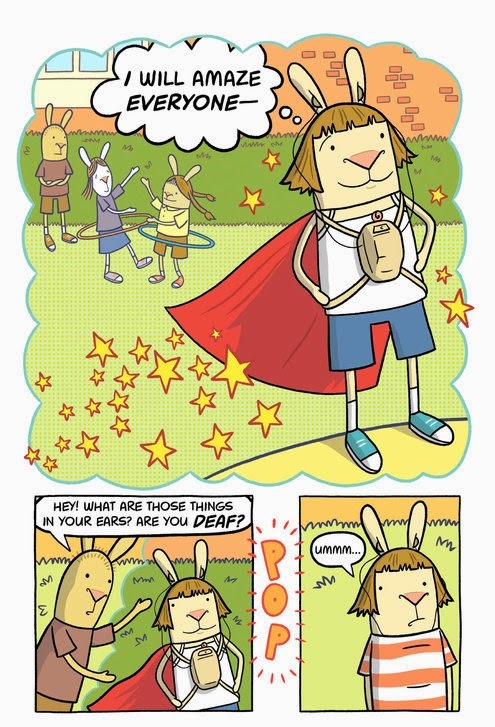 You will not be able to resist rooting for El Deafo! 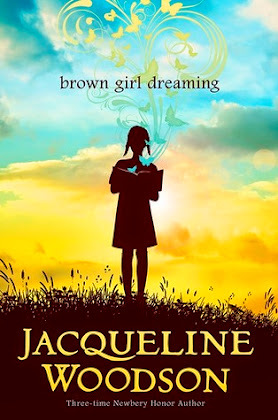 Jacqueline Woodson's expertly written memoir of a young African American girl's journey through a childhood in Ohio, South Carolina, and eventually Brooklyn during the Civil Right's movement should be in every 5th to 8th grade classroom, every school library, every "Must Read" shelf at the local library, every family bookshelf. Initially I was surprised by her choice to write Brown Girl Dreaming in free verse, but the quiet simplicity creates stark contrasts. Each verse explodes in turn with joy, heartbreak, circumspection, nostalgia. Even the briefest statement can have huge impact in this form. The entire book is amazing, but part of the beauty of Woodson's book is that individual chapters, verses, even lone sentences could easily fit alongside many Language Arts or American History curricula. In today's world of Common Core with snippets of a variety of texts, many teachers will rejoice to include Woodson's work among the required reading. 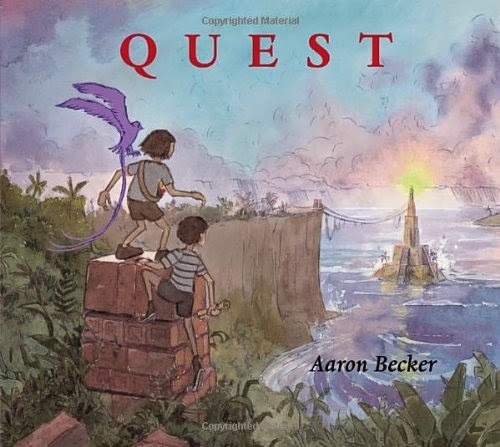 After reading Journey, the Caldecott Honor-winning wordless picture book by Aaron Becker, I was certain there would never be another wordless picture book as beautiful and captivating as Journey is. And then Becker came along and released a sequel. If possible, Quest is even more captivating than Journey. Oh sure, there are far less lovely, quiet scenes of sparkling streams and rolling hills, deep forests beckoning our adventurer. But there are more majestic cities, amazingly detailed architecture, for which Becker is quickly becoming known, and breathtaking scenery. Quest is truly an epic sequel. (I don't often toss around the word "epic", especially for a picture book, but there is no other description for this incredible work of art.) 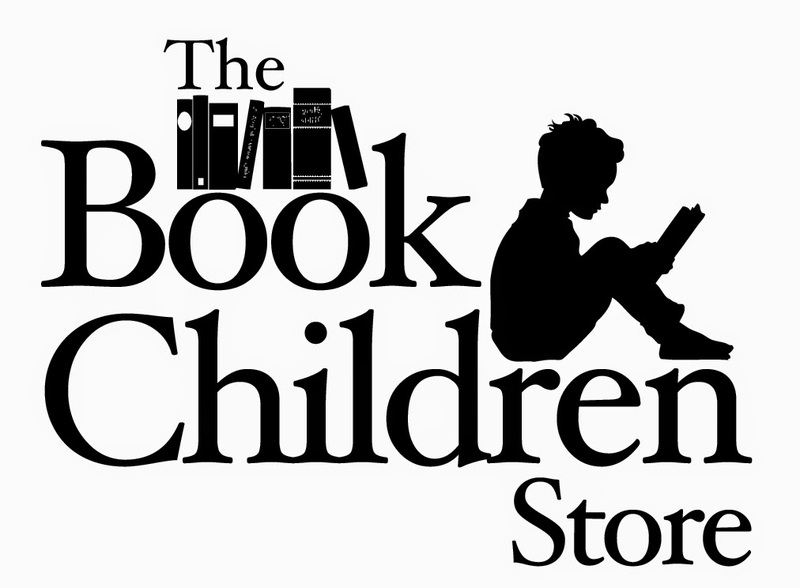 Storybreathing.com is an appropriate title for Becker's website; the story breathing he manages with pen, ink, and watercolor is simply remarkable. 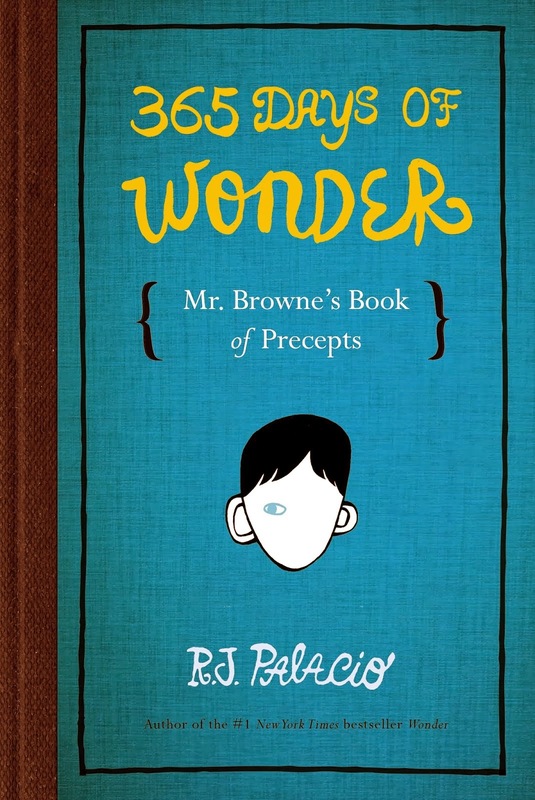 Although R.J. Palacio's Wonder remains one of my favorite children's novels, and The Julian Chapter provided a satisfying glimpse into the bully's perspective, I wasn't sure about the 365 Days of Wonder when I heard that Mr. Browne's Book of Precepts was being published. Sure, a book of thoughtful sayings to ponder sounds nice, but not exactly the kind of book kids are likely to pick up for pleasure reading. 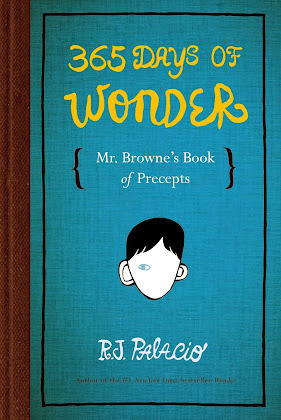 When I actually saw 365 Days of Wonder in my local bookstore last week, I changed my mind. I still don't think that most kids will pick this book up just to read it. It actually wouldn't take very long! But I really fell in love with the notion of a precept a day. At my own home, I'm keeping our copy near the kitchen table so that most mornings we can read the precept before scattering about our day. I think many teachers could find usefulness in the quick lessons taught here, or use them as writing prompts. 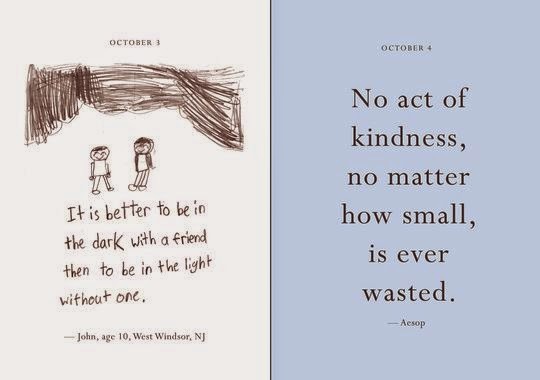 My favorite parts though are the pages of precepts written by other children. Their ages and cities are noted in the contribution section at the end of the book. I'm thrilled to see the evidence that Wonder has impacted so many children and will continue through these variations on choose kind. Another nice touch that Palacio included are the essays by Mr. Browne at the end of each month. Each essay provides another insight to the story or to a character quality mentioned. I'm eagerly waiting to see what Palacio's next work might be. She really has a talent for developing the Wonder story. I have every expectation that her next project will be a winner as well. 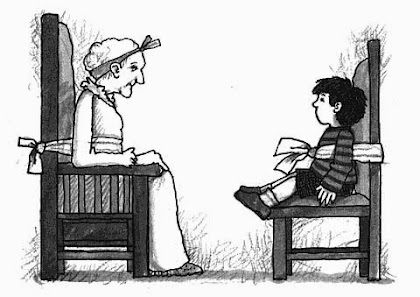 Tomie dePaola has long been a favorite children's picture book author of mine. His Streganona series is hilarious and sweet. We've read dozens of his books from his Bible stories to his Native American legends. I'm almost ashamed to admit that I never even knew about his 26 Fairmount series until several months ago when I stumbled upon the first one at our local used bookstore. 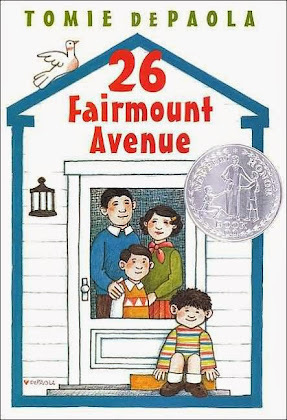 26 Fairmount Avenue is the first book in dePaola's autobiographical early chapter book readers series. 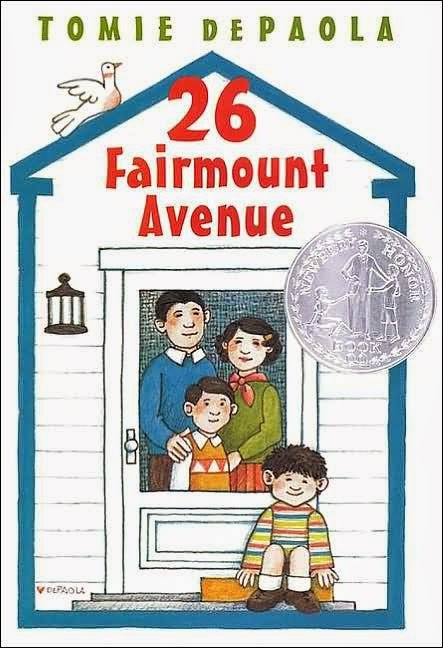 The story begins with the hurricane that hit his hometown of Meriden, CT in 1938 and continues through his kindergarten year until his family finally moves into their long awaited new house at 26 Fairmount Avenue. Each chapter contains a nearly independent story of an event that happened in dePaola's life during that period from spending time with his great grandmother, Nana Upstairs, to watching Disney's Snow White on the big screen and is woven with updates to the house that dePaola's family was building during that time. These events are relayed with dePaola's knack for beautiful storytelling. His ability to tell historical events through the lens of a young child brims with charm. My 7-year-old and I couldn't put the story down, and he's already asking for other books in the series to read on his own. Ellie, beginning middle school with a best friend who has just found a passion in volleyball, is dismayed over the changes happening in her life when a surly, grouchy teenager steps into her life. This teenager happens to be her grandfather, a scientist made young again as the result of an anti-aging experiment. Forced to attend school with Ellie, Melvin, her grandfather, has a contentious relationship with Ellie's mother, despite their reversed roles. Worse, he's been kicked out of his own scientific laboratory as a trespassing teenager! 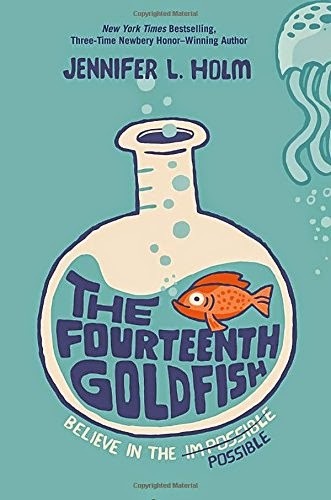 As Ellie tries to help her grandfather retrieve his scientific formula, she learns about famous scientists, her mother's rebellion in choosing the arts over science, and even her own proclivity toward scientific thinking. This is the first book I've read by Jennifer L. Holm. 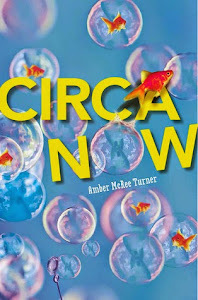 The cover art is eye-catching and cute in this fun and engaging middle grade read. The story is charming while departing astute observations on family dynamics. Ellie's divorce parents not only parent without dysfunction, but they are actually friendly toward each other. And Ellie discovers that despite her grandfather's and mother's oil-and-water relationship, she actually identifies with her grandfather's scientific obsession. The Fourteenth Goldfish is a humorous, enjoyable, speedy read, not laden with heavy vocabulary, and filled with realistic, identifiable characters. I hope we'll see more middle grade books coming from Jennifer L. Holm! 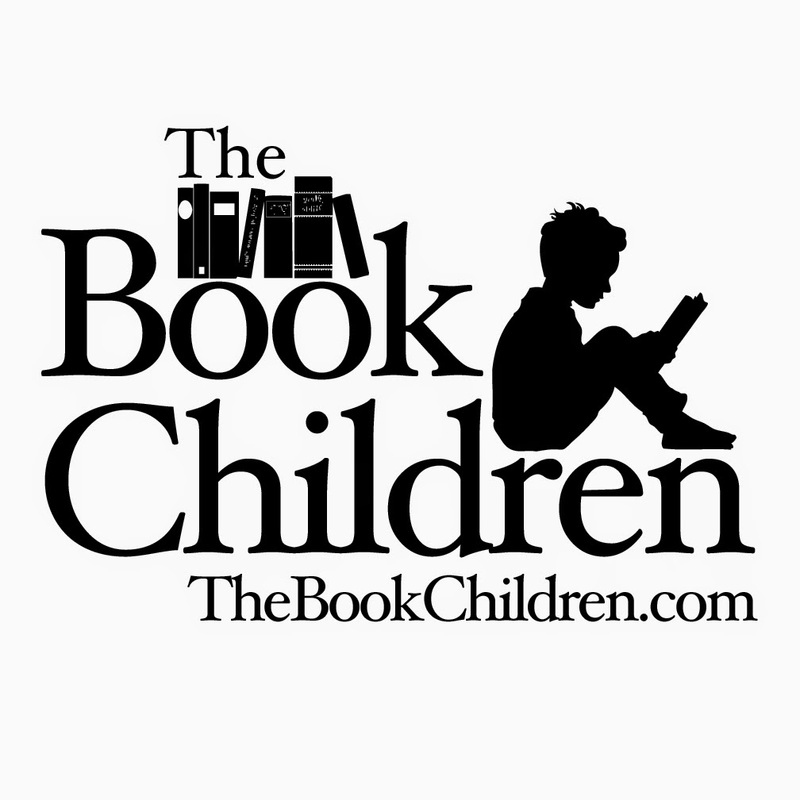 Follow The Book Children by Email!